Ok, so a few months ago I reviewed the BurdaStyle Wardrobe Essentials book, and came to the conclusion that I probably didn’t really need the dress book, but I somehow ended up getting a copy anyway. Amazon informed me that my order would arrive March 9, 2015, the product page states that the book will be available in January, but the button says you can order it now. My copy came today. Good job on arrival predictions and cohesive information Amazon! 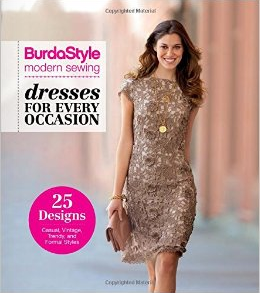 My conclusion is essentially the same as for Wardrobe Essentials – this is a great book for someone who is an intermediate seamstress wanting an introduction for Burda patterns, but it isn’t really necessary for anyone who is a long-time subscriber to the magazine. While seam allowances and extra instructions are nice, they aren’t strictly necessary for a more advanced Burda user. It also doesn’t have patterns covering the higher size ranges. I think the book serves its intended purpose well, but I don’t think it will be of much interest to those who already have the patterns, or don’t like Burda’s general style. I do think this book would be a great gift for someone who is still newer to the hobby, as it has a good variety of styles, the patterns are a nice range from very easy to mildly challenging, and the book is quite a good value considering the number of patterns included. Thanks for including a detailed list of patterns. I was wondering about the range included.